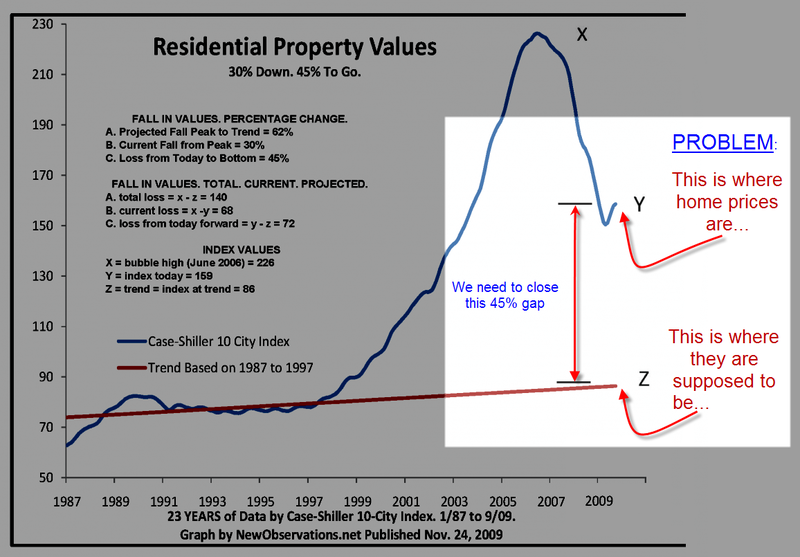 The chart above of the Case-Shiller Index shows that home prices were on trend in the 90’s, then the start of the housing bubble around 2008, the bubble itself, and the current correction. The problem the chart is telling us which you may have noticed, is in that rather large gap between where we are and where the normal appreciation of housing in a normal economy would be right about now. That gap represents an additional 45% decline in home values. As much as the government would like us not to listen, you just can’t escape the story that fundamentals tell. Facts are stubborn, stubborn things. If the government could outlaw facts, I think they would…unless they could find a way to tax them. A fact tax. The Case-Shiller Index is widely respected and anticipated. Back in 2004 when I started researching the housing bubble, it was an obscure paper that Professor Robert Shiller wrote at Yale that taught me the basic economics and history of housing bubbles in the United States. I was considering buying a home at the time, but something about the bidding wars and astronomical home prices didn’t sit well with me. So I decided to start doing some research. My question at the time was, “Is this normal?” I was at Starbucks reading patrick.net, one of the first housing bubble bloggers. I stumbled across a link to Shiller’s paper and paid something like $2.00 to read it. It was an epiphany moment. His paper made it very clear that housing bubbles have occurred several times before, that we were currently in one and that it was shaping up to be the largest bubble anyone had ever seen. I credit patrick.net and Shiller’s paper as the original support for my decision to stay out of the housing market, sit back, make some popcorn and watch the insanity unfold. I’ve been researching the housing market and educating myself in economics ever since. We still have a long way to go. And that little blip on the chart where home prices went up recently…that is what we call a head fake, a dead cat bounce or a bull trap. All that means is, don’t believe it. The summer selling season, combined with state and federal home buying incentives, low FHA lending requirements, low interest rates and a wave of foreclosed homes flooding the market convinced enough people to buy into what is still an incredibly overpriced market. That will not last. In the months to come, I will post an updated chart that shows the continued decline from that bull trap. As I’ve stated in my prior posts about housing, there is still significant downside risk.